TANCET 2019: Tamil Nadu Common Entrance Test (TANCET) is a state-level entrance exam. TANCET is managed by Anna University (AU), Chennai offering admission for various PG courses. Tamil Nadu CET exam is conducted every year for candidates to get admission in Anna University or any other affiliated colleges of the universities of Tamil Nadu. It offers various courses like M.Tech, M.E., M.Arch, M.Plan, MBA, and MCA.TANCET Exam will be going to held probably in the month of May 2019. Anna University will publish the notification for starting date of TANCET Application Form very soon. TANCET Schedule will be announced by Anna University on its official website www.annauniv.edu. Candidates can check the dates related to TANCET Exam. TANCET Entrance Exam Date will include the entire schedule related to admission procedure for postgraduate level courses. We are providing you expected dates, go through it. We will update you with actual dates later. Candidates have to fulfill all the eligibility criteria for the exam, All are listed below. Make sure to read it carefully and if you are eligible, Fill the Application Form. M.Tech Bachelor’s degree or equivalent exam with minimum 50% marks (For SC/ST 45%).GATE score card is required. MBA Candidate must have passed the minimum of 3 years Bachelor’s degree with minimum 50% marks (For SC/ST 45%). MCA (For Lateral Entry) Must have in B.Sc (Computer Science/Information Technology) or BCA with mathematics at 10+2 or graduation level with minimum 50% mark (For SC/ST 45%). Candidate appearing for final year exam during April/May 2019 can also apply. Other state candidates can also apply but eligibility will be decided by the authority of respective colleges. No need to apply for TANCET 2019 exam for the student having valid GATE score card. Candidates having GATE score card in Engineering Science (XE) and Life Science (XL), need to appear in TANCET exam. Candidates can register through online only by filling-up the TANCET 2019 Registration Form. Anna University will publish the TANCET Application Form in 1st week of April and end of submitting the application form will be last week of April. The application fee will be Rs.500 for General/OBC Candidates (Rs.250 for SC/ST/PWD) All the Candidates are advised to go through the steps given below. Then click on Registration link given there. Register with your name, valid e-mail id and set a password. To apply for the application form. Login with your registered email id & password. Fill all the personal & academic details. Upload photographs of required size and format. Then submit it and it will go to payment page. Pay the fee through online mode via Net Banking/Card or any other way. After completion of payment process, the application form will be generated in PDF format. 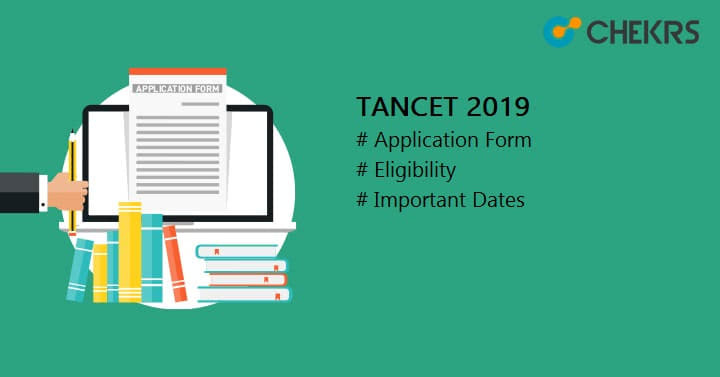 To get familiar with TANCET entrance exam, it is compulsory to know the TANCET 2019 exam pattern. Anna University releases the exam pattern for TANCET exam. Total time duration will be 2 Hours. There will be total 100 questions. It will be of objective types. Mode of conducting exam will be offline (Pen-Paper). For every wrong answer, 1/3 mark will be deducted. There will be 3 sections For ME/M.Tech/M.Arch/M.Plan. Part 1& 2 will be compulsory and Part 3 will be according to course selected during registration. The Syllabus will be different for all the courses. Candidates should prepare for the exam according to the syllabus. University will declare the Anna University TANCET syllabus in online mode. MCA Quantitative ability, Analytical reasoning, Logical reasoning, Computer awareness, Verbal ability and Basic sciences. MBA Verbal Ability, Data Interpretation, Quantitative Aptitude, Logical Reasoning. Part III As per the discipline selected (Chosen Subject). TANCET Admit Card will be released by the authority of University in the month of May. It is mandatory to carry the admit card at the time of examination. Admit card contains the name of the applicant, exam center, examination date & timing, applied course. TANCET Hall Ticket will be available online only to those applicants who had successfully filled the application form. Login with registered mail id & password. Click on the link given here to download the TANCET Admit Card. Save it and take the print of admit card. NOTE: In case, if admit card will be misplaced then a duplicate admit card can be obtained by with payment of Rs.100/- in the form of a Demand Draft (In favour of The Secretary, TANCET, Anna University, Chennai, payable at Chennai) with a written request including Registration/Application number and Exam Center. After successfully conducting the TANCET exam, the official authority of University will release the TANCET Result probably in 1st week of June on their official site www.aanauniv.edu. Visit the official site given above. Log in with your UserId & password to access the result. Click on the link ’TANCET 2019 Result’ to download the result. AU will decide the TANCET 2019 Cutoff in online mode after result declaration on the basis of various factors like Number of appeared applicants, the difficulty level of questions, previous year cutoff, categories, reservation and number of seats available. Cut off will be released for various government and non-government colleges in Tamil Nadu state. The rank list will be prepared based on cutoff marks. GATE score card/TANCET Score Card. TANCET Counselling will be started after releasing the result, cutoff and rank list. Candidates who passed the qualifying exam/GATE exam will be called for counselling. Applicants who satisfy the cutoff marks will have to register for counseling. The counselling Form will be available both online as well as offline.